Minnesota Rising was pleased to feature some incredible Open Space breakout session presentations, including Jeff Ochs, who led a session about his new nonprofit concept and entrepreneur-inspiring board game, Snake Oil. 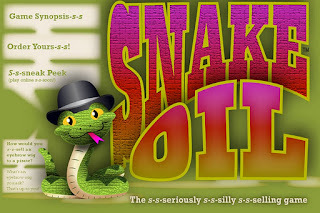 Snake Oil is now for sale and could be the perfect gift for any last-minute holiday shoppers. Thanks, Jeff, and continued good luck on this strategy for teaching and coaching the next generation of entrepreneurs!